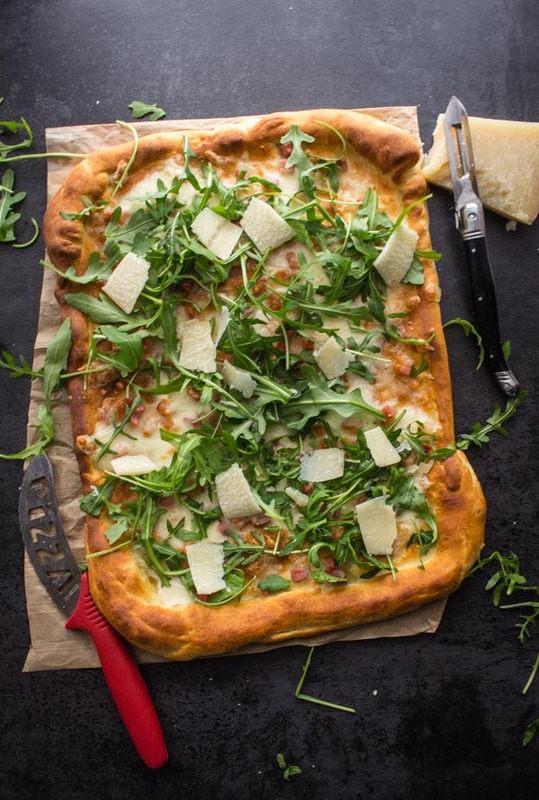 Italian Pizza Bianca, this Best Easy White Pizza is made with pancetta, mozzarella, parmesan flakes and arugula. So good, one of the best Pizzas! You will never miss the Sauce. Whenever I made pizza, ate it in a restaurant or ordered take out it was always red pizza with olives or a classic Margherita. Never white, why? I have no idea! So what exactly is a White Pizza / Pizza Bianca? In Italy pizza bianca means “white pizza”, which is a Pizza drizzled with olive oil and salt and of course no Tomato Sauce. 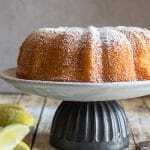 Sometimes topped with Mozzarella or Parmesan Cheese. Some people like to top their White Pizza’s with roasted veggies, seafood or even greens. And one of my favourites Potato. One day I was out shopping with my sister-in-law and I noticed her buying arugula and parmesan. At that time I wasn’t really impressed with Rugula/Rocket (arugula) and I asked her what she was planning to do with it. 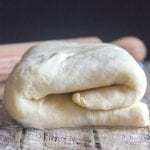 And if you want to make your own dough, this Pizza Dough Recipe is perfect. She told me she made pizza with it. We discussed how I had never really used arugula and then she told me about one of the most scrumptious pizzas ever. 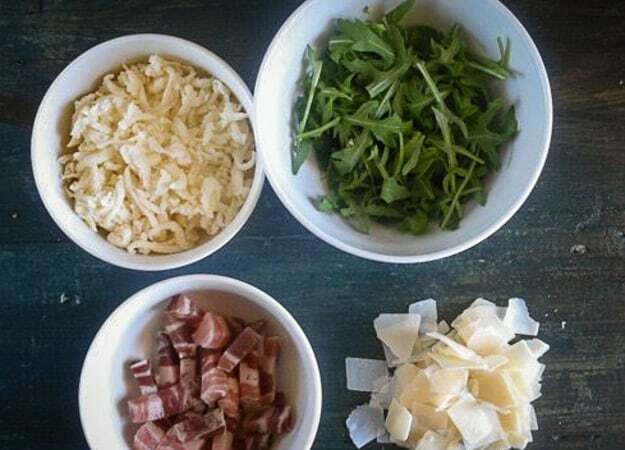 Bake your pizza dough with the pancetta first, don’t add the cheese or the arugula. After the amounted time, then add the shredded firm Mozzarella and bake just until the cheese melts. 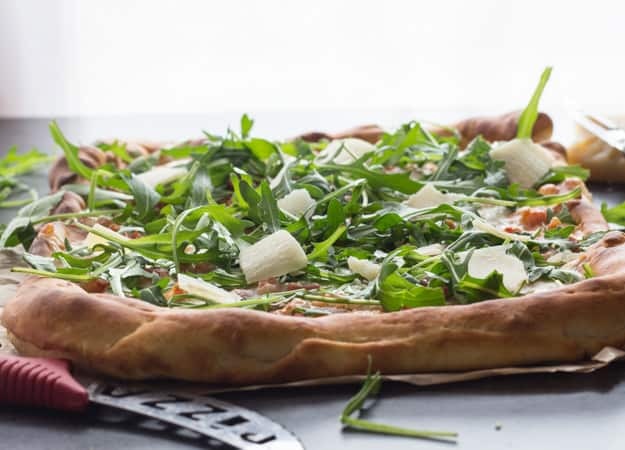 Remove the Pizza from the oven and then top it with the Arugula / Rocket and flaked Parmesan. It’s best to flake your own Parmesan, packaged cheese never tastes as good. You won’t even miss the Tomato Sauce! So I think it is her fault that I never come home from shopping without a bundle of arugula nowadays! 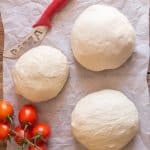 Now for every Red Pizza I make I will make 2 White Pizzas, so give it a try, nothing beats a great and tasty White Pizza Recipe. Buon Appetito! 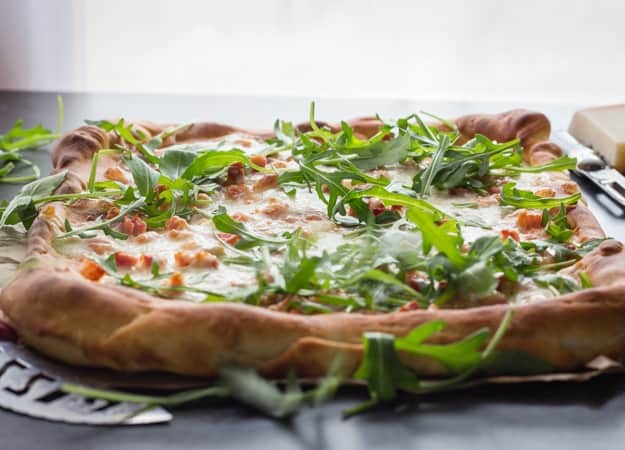 A delicious Italian Pizza Bianca (white Pizza), made with 2 cheeses, bacon (pancetta) and arugula. No sauce needed! A must try. Pre-heat oven to 450° (250°) (that's as hot as mine goes). Lightly oil a 12 inch pizza pan (30 centimeters). 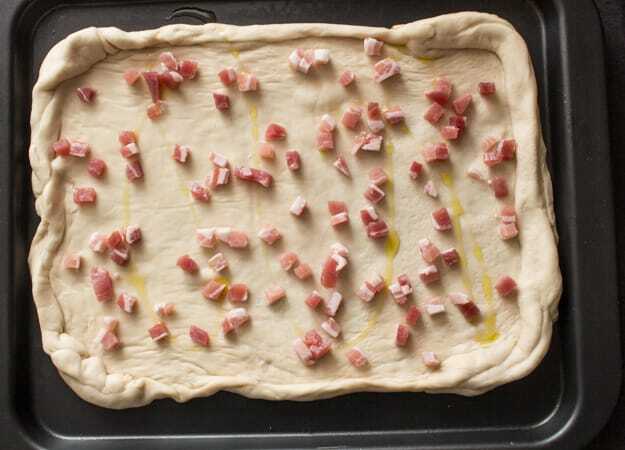 Place dough on pizza pan and top with pancetta, bake in oven for 10-12 minutes, remove from oven and top with grated mozzarella cheese, bake for approximately 3 minutes or until cheese melts. Remove from oven and top with arugula and sprinkle with flakes of parmesan. Serve immediately, Enjoy! 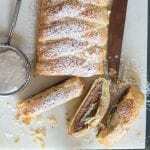 I make mine with anchovies fresh mushrooms kalamata olives cspers sometimes and a sprinkle of chill flakes. Hi Mikr, that sounds amazing. Have a great Sunday. 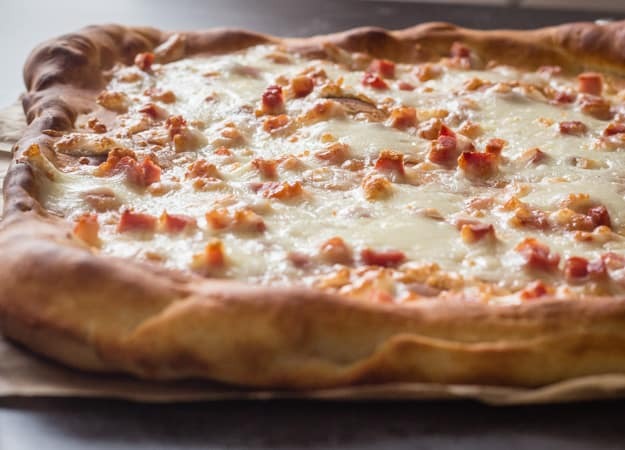 I love the sound of this, idea… The Hungarians have a version of white pizza and that has a base sauce of sour cream, it’ not for me but my wife loves it. I love love love pizza but I have to admit I’m pretty boring when it comes to toppings. But I have some white sauce leftover after making shrimp alfredo the other day so I’m definitely making this one! Hi Meaghan, I have never made it with white sauce, but let me know how it turns out. Hi Mary, I love the stuff I could put it on everything. Thanks and have a great week. These pizza recipes look fabulous! Can’t wait to try some of them. Thanks for sharing! Anything that makes pizza healthier is a winner in my book! Hi Kristina, thanks so much. Hope you enjoy it. Simple yet healthy!! 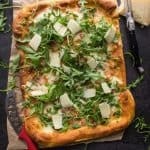 I’ve never tried pizza with arugula before, but the salty panchetta would pair perfectly with the spicy arugula, YUM!! There is nothing like white pizza. I usually make mine with ricotta cheese and fresh mozzarella. Definitely am going to try your recipe. Thank you. Hi Ann, oh that sounds good, I will have to try that next time. Hope you enjoy it.